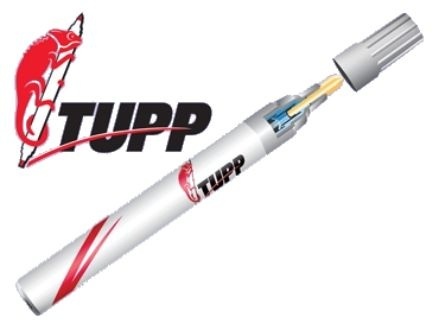 TUPP single stage paint pen is ergonomic, light and easy to use.<br> <br> It allows quick, one-step repairs of small scratches and nicks that may appear on any painted surface.<br> <br> It will meet the highest colour matching expectations.<br> <br> The patented valve mechanism and gravity action of the paint pen will give you an even flow of all components assuring the same particularities and brightness of the original finish.<br> <br> An edged polyester fibre tip allows accuracy and can be removed to be cleaned or replaced.<br> <br> The paint pen has a closed opaque container preventing accidental spills, hardening of the paint and colour change due to light exposure before the application.<br> <br> <b>TUPP single stage paint pens - Features & Benefits</b><br> <br> <br> The Pen: Paint is held in a barrel and automatically dispensed through a fine felt tip, providing the user unparalleled control over their painting instrument.<br> <br> <br> The Paint: High quality urethane paint is used which is the same as your vehicles manufacturer. This paint provides the user with a much closer colour match than other companies which primarily use lacquer (old technology) paints.<br> <br> <br> The Results: The best you can get without refinishing the damaged areas.<br> <br> <br> <b>Usage Tips</b> <br> 1. Make sure the touch-up area is clean and free of wax or the paint will not properly adhere.<br> <br> 2. Secure the cap and shake the TUPP pen vigorously for about a minute for the best colour match.<br> <br> 3. Burp the pen! Gently press the tip down inside the pen with the tip facing up. This will release any pressure that may have built up.<br> <br> 4. Select a test area other than your car to depress the tip and practice using the pen, i.e. the door jam of your car.<br> <br> 5. Depress the tip of the pen gently and repeatedly, until the paint flows through to the tip. To completely soak the tip can take up to one minute. Once the tip is totally soaked with paint you are ready to touch up your car. NOTE - for best results do not depress the tip too hard or fast as excess leakage may occur.<br> <br> 6. Fill each chip or scratch once and let dry for about five minutes. Repeat once or twice if needed.<br> <br> 7. Make sure the cap is always on the TUPP pen when it is not in use. Store the pen at room temperature on its side. If the tip becomes dry or brittle, hold the pen upright and remove the tip from the barrel. Keep the pen upright so paint does not flow out! Moisten the tip in a little paint thinner and re-seal.<br> <br> <br> <b>Advanced Usage Tips for chips, fine scratches and wide scratches</b><br> <br> Chips: Make sure that the pen has a good flow of paint. This is accomplished through lightly dabbing the tip against a surface other than your vehicle. After a good paint flow has been achieved, you should then proceed to lightly touch the chip with the tip of the pen to the bottom of the chip. For best results, wait at least 5 minutes between coats. Repeat this process until the chip is fully covered.<br> <br> <br> Fine Scratches: Make sure that the pen has a good flow of paint. Holding the TUPP pen like you would a pencil or ink pen, hold your hand as steady as you can and very lightly draw a fine line across the scratch from left to right, trying to stay inside the lines. For best results, wait at least 5 minutes between coats. Repeat this process until the scratch is fully covered.<br> <br> <br> Wide Scratches: Lightly pressing tip across scratched area, almost making small-connected circles, will fill wide scratches.